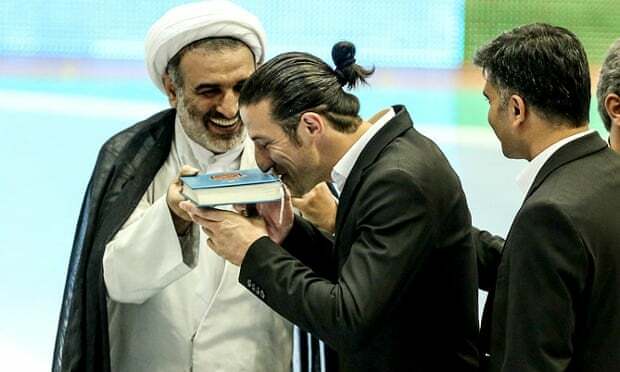 As Iran’s national football team prepared to head to the World Cup last year, Andranik Teymourian stood next to his teammates while they lined up to kiss the holy Islamic book, the Qur’an, as part of the farewell ceremony. Athough he is not a Muslim, the Iranian Armenian didn’t want to rock the boat and so performed the ritual for travellers, which is a quintessential part of Iranian culture. The cleric holding up the Qur’an could hardly disguise his amusement at the scene. The 32-year-old midfielder, known as Ando – or Samurai, due to his hairstyle – is not shy of showing his Christianity, often crossing himself on the field. In April, Teymourian, who has played for Bolton Wanderers and Fulham, became the first Christian to lead Iran’s football team as its permanent captain. Ethnic Armenians make up the majority of Iran’s estimated 300,000 Christians. Armenians are fully integrated in Iranian society, from the musician Loris Tjeknavorian to Sombat Hacoupian, who founded one of the country’s most famous men’s clothing brands and is now a household name. Although Islam is Iran’s official religion, it recognises Christians, Jews and Zoroastrians as accepted religious minorities. They are permitted their house of worship and usual religious services, and have reserved seats in the Iranian parliament. In a country where alcohol and pigmeat are forbidden, Christians are allowed to distil booze and eat pork. There are at least 600 churches in Iran, including the sixth-century St Mary Church of Tabriz, mentioned by Marco Polo in his travel book. The adjacent province of West Azerbaijan boasts the ancient St Thaddeus Monastery, a Unesco world heritage site. When Hassan Rouhani came to power in 2013, he appointed Ali Younesi, a former intelligence minister, to serve as his special assistant in minorities’ affairs. It was the first time such a position had been created. Significant improvements have since been made but many big challenges remain. In April, as Iran’s northern neighbour, Armenia, commemorated the centenary of the 1915 genocide, the Iranian government, which is usually nervous about public gatherings, took a rare decision to allow Iranian Armenians to stage a protest in front of the Turkish embassy in Tehran. The official attitude towards other minorities has also changed. In February, Younesi announced that Jewish students officially no longer had to go to school on Saturdays, the sabbath day in the Hebrew calendar. Iranian school weeks run from Saturday to Thursday, and Friday is the end of the Iranian week. “There are numerous reasons why my family left Iran in 1987, but an important one was the decision by the Iranian government that year not to officially recognise the holy sabbath as a religious day off for Jewish students,” an Iranian-Israeli, Meir Javedanfar, blogged recently as he hailed the new decision. Rouhani’s administration has tried to revamp Iran’s image, especially concerning the official attitude towards the country’s Jewish community, after it was badly tarnished under his predecessor, Mahmoud Ahmadinejad, who was notorious for his Holocaust denials and antisemitic tirades. Rouhani took Iran’s sole Jewish MP to New York with his entourage in his first visit to the UN general assembly. He has since condemned the mass killings of Jews by the Nazis as crime against humanity, tweeted a Rosh Hashanah blessing for Jewish new year, and honoured Iranian Jewish soldiers who lost their lives in the eight-year war against Iraq in the 1980s. The government last year donated nearly half a million dollars to Tehran’s Jewish hospital. But hardliners, who are strongly opposed to such conciliatory moves, have not remained quiet. Instead, they have held Holocaust denial cartoon competitions in the capital. 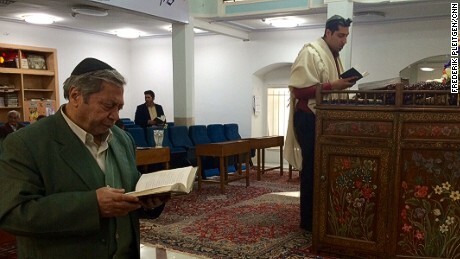 Iran is believed to have the largest Jewish population in the Middle East after Israel. But the country’s Jewish population slumped after the Islamic revolution, when many Iranian Jews emigrated to Israel or other countries. In spite of animosity between Iran and Israel, Iranians are the least antisemitic people in the Middle East, according to the latest poll by the US-based Anti-Defamation League (ADL). However, although Iranian Jews are free to practise their faith like other minorities, some report feeling like second-class citizens. 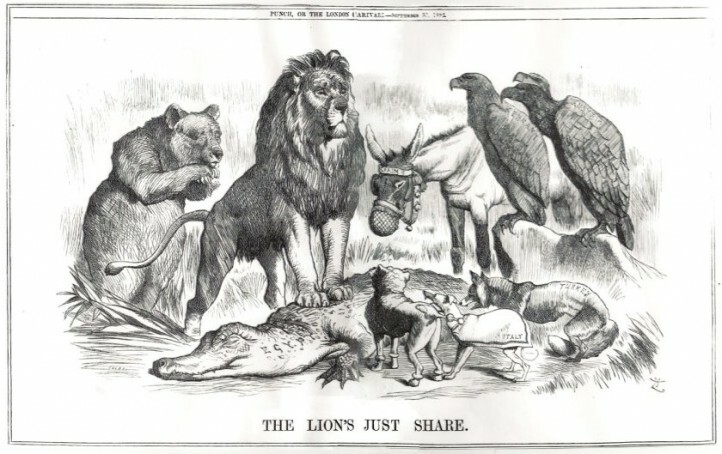 The situation of Zoroastrianism is much better. Iranians were Zoroastrians before Islam arrived in Iran and the country’s culture is a mixture of Islamic and Zoroastrian traditions. Many traditions survive from those ancient times, such as Nowruz, or Persian new year, which is a holy day for Zoroastrians but also the most important holiday for millions of Iranian Muslims. Amid improvements, one notable exception is the Baha’i faith, which is still banned and its followers persecuted and even imprisoned. Those in jail include Faran Hesami, a Bahá’í mother of a four-year-old, who was arrested for teaching members of the community in Iran who are banned from university because of their religious affiliation. Seven Bahá’í leaders have been imprisoned for the past seven years, each serving 20-year sentences. * * * “Some 100 Bahá’ís are wrongly imprisoned solely because of their religious beliefs, thousands more are excluded from higher education, and the Bahá’í community as a whole is discriminated against in employment and prevented from freely assembling for worship and community activities,” said Diane Ala’i, the representative of the Bahá’í International Community to the UN in Geneva. Iran also remains highly sensitive towards the issue of conversion. Muslims who convert to other religions risk being arrested. More than 90 are behind bars, includuing pastor Saeed Abedini, who holds an Iranian American citizenship. Muslims whose denominations are not accepted by Iran, such as Gonabadi dervishes, face persecution, with many of their members in jail. Rouhani is trying to improve the situation of ethnic groups. Earlier this year, Iran unveiled the first book in Kurdish language to be officially taught in schools in the country’s Kurdistan region. However, widespread persecution persists against Arab, Kurdish and Azeri activists. In December 2013, in a rare example of a politician from a minority group being promoted in Shia-dominated Iran, a Sunni woman, Samieh Baluchzehi, who belongs to the country’s Baluchi ethnic minority, was chosen as the mayor of a provincial city.